and welcome to my ship, the Jolly Roger 'erself!" It was a time of daring, a time of great nobility and dastardly deeds. It is the era of the rise of nations and the greatness of their kings and queens. And within their realms, there are struggles for power where the innocent are trampled, and churches are sacked, and evil exists with the law powerless before it. Good monarchs live in fear of the evil. Dishonorable kings break treaties and overburden their citizens with taxes. Those citizens, those residents have no authority. Nobility are above the law, yet somehow wrongdoing must be stopped. Who will answer this call for justice? For the heroes who will take on this evil, there will rarely be thanks. It takes a special individual to stand for the rights of the people. This then is the time of the SWASHBUCKLER! 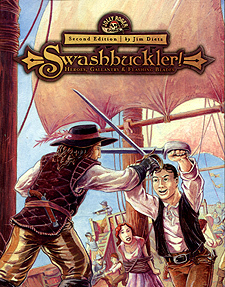 In Jolly Roger Games' role playing game Swashbuckler!, players become heroes, championing the causes of right and justice against all foes whether malicious criminals or unscrupulous monarchs. Live the life a high-seas captains, armed with letters-of-marque, battling pirates and Spaniards for gold in the Caribbean. Become a gallant knight rescuing maidens from towers. The possibilities are unlimited, except for your imagination.